“Naginata-goke” (the Japanese long sword lichen). The long podetia, frequently over 10 cm long, usually unbranched and tapering at the tips, recall the Japanese long sword. 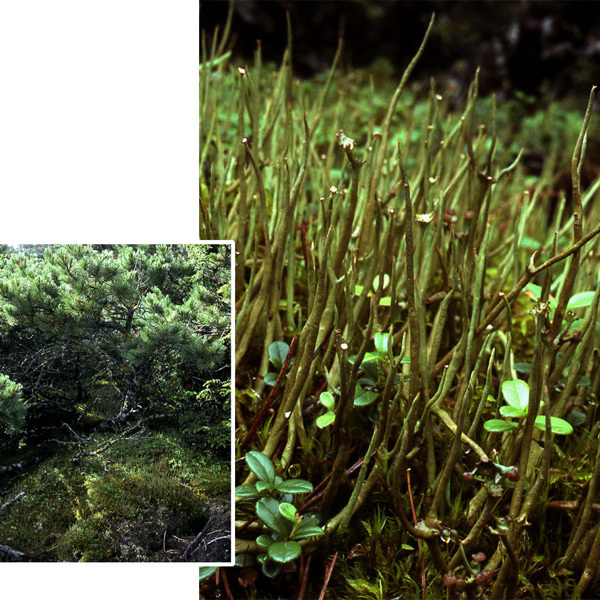 In Japan it grows on the ground frequently in partial shade under Pinus pumila scrub (left photo) or among dwarf shrubs in “the alpine zone.” Photo by H. Harada; ca. 1800 m elev., on Mt. Nipesotsu, Hokkaido Isl., northern Japan, 21 August 1986.